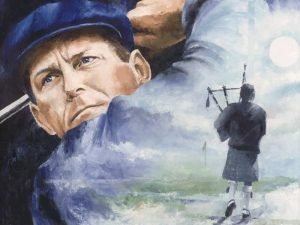 Payne Stewart Painting. Prints are available of the legendary PGA golfer, Payne Stewart, who died in a plane crash in 1999. The original canvas is 24″ x 30″ and the artist depicting Stewart with his known determination to win. The bag piper walks along the golf course towards heaven in the background.